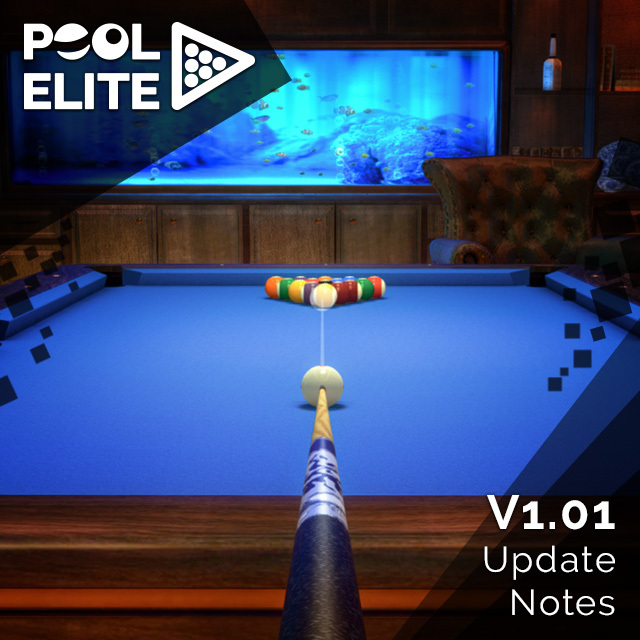 Pool Elite V1.01 Update is out! We made some improvements and bug fixes on our game mostly according to your feedback. We will keep working on new features, please continue to share your suggestions with us. – You can use TAB button to change camera. – You can change camera with right click on spectator mode. – Screenshot share button is added to in-game screen and match result screen. – You can use Space button on keyboard to shoot. – You can minimize and maximize chat screen in-game. – If you send a duel request to your friend, that friend will have a duel icon near his/her name on friend list. – The visual bug of seeing the country flag of opponent as hidden is fixed. – The bug which shows wrong statistic values between 9 Ball and 3 Cushion game modes on profile is fixed. – When you use CTRL button to change camera, the name of camera will not be shown on middle of screen. – If your opponent quits match within first 60 seconds (90 seconds in Snooker), you will not be able to win chips from that match. Keep sharing your feedback with us. If you find a bug or issue, please also share with us and feel free to ask us any questions you may have.